Here is a fun Valentine's Day themed print called 'Heart' from artists Love + Made. This is a 5 colour 12 x 12 inch screen print on Coventry rag archival paper with an edition size of 50, comes embossed, signed and numbered by the artist for $65 each. ** This print does NOT come framed. Here are two new pieces by artist Ian Millard. 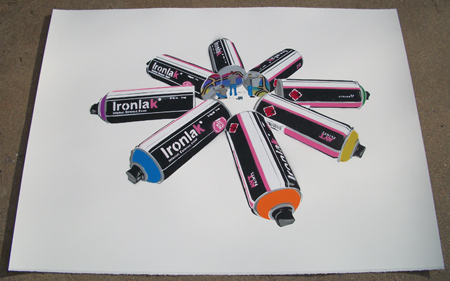 The above image is called 'Ironlak Attack', it is a 30 x 22 inch stencil print with an edition size of 20, comes signed and numbered by the artist for $90 each. Ironlak Attack will be available on Wednesday February 10th at 1pm EST. 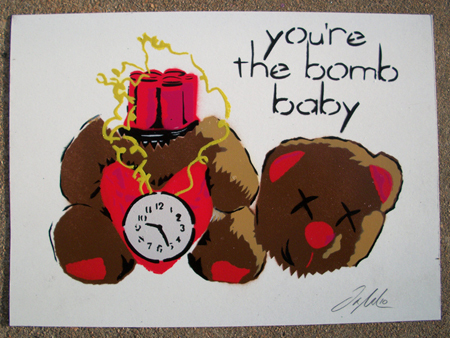 Below is 'You're The Bomb Baby' a cool Valentine's Day themed print. This is a 6 layer aerosol on 9 x 7 inch Strathmore bristol has an edition size of 25, comes signed and numbered by the artist for $20 each. This one is available NOW! !